GUNS N' ROSES will embark on a seven-show Asian tour in November. The trek, which will kick off on November 8 in Jakarta, Indonesia, will include the band's first-ever visit to Manila, Philippines, as well as stops in Kuala Lumpur, Taipei, Hong Kong and Abu Dhabi. 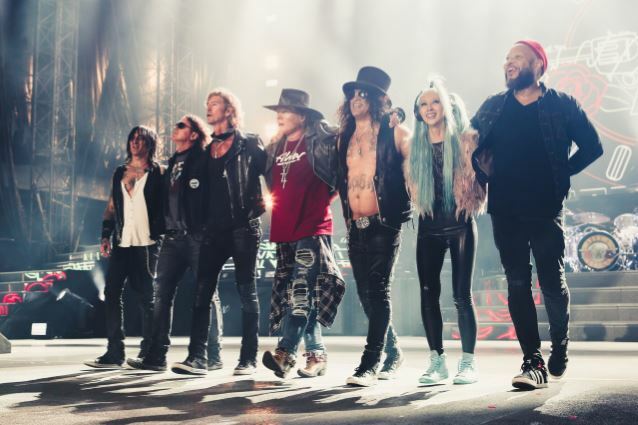 GUNS N' ROSES' "Not In This Lifetime" ranks as the fourth-highest grossing tour of all time, based on Billboard's Boxscore archives. The trek, which launched in April 2016, topped the $475 million mark in gross sales with the final show of the band's 2017 touring schedule on November 29 in Los Angeles. "Not In This Lifetime" has surpassed Roger Waters's "The Wall Live" tour that earned $459 million from 2010 through 2013. U2 tops up the all-time list with $736 million from its "360°" stadium tour (2009-2011) followed by THE ROLLING STONES' "A Bigger Bang" at $558 million (2005-2007). COLDPLAY is third with its recently completed "A Head Full Of Dreams" trek that grossed $523 million (2016-2017). About seventy people travel with the "Not In This Lifetime" show in addition to the truck drivers; that number goes upwards of five hundred, including the local workers, by show date once catering, security, etc. are factored in, according to the GN'R tour's production manager, Dale "Opie" Skjerseth. GUNS N' ROSES will return in June for a seven-week European jaunt.